Sarah Walker introduces music for Cello and Piano, performed by Steven Isserlis and Connie Shih at the Pittville Pump Room in Cheltenham. Sarah Walker introduces highlights from the 74th Cheltenham Music Festival and performances given in the Georgian splendour of the Pittville Pump Room. Today, Steven Isserlis and Connie Shih present a Cello version of César Franck’s passionately romantic Violin Sonata, composed as a wedding present for his friend. Plus, Isserlis’s own arrangement of Clara Schumann’s characterful Three Romances. Charles Owen performs Ravel’s dreamy musical impression of a boat at sea. 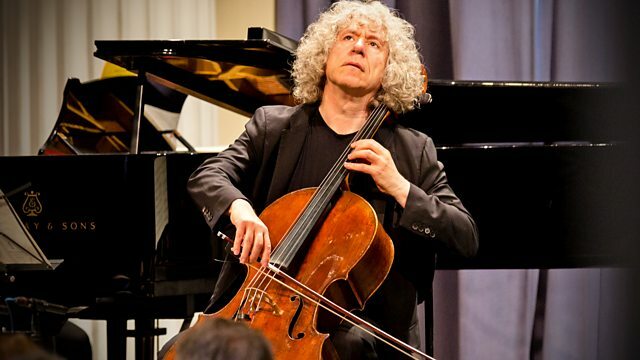 Performer: Steven Isserlis. Performer: Connie Shih. Music Arranger: Steven Isserlis. Performer: Steven Isserlis. Performer: Connie Shih.